United States (USA) county map with editable count objects and borders. Easily segment states and counties for territory illustrations! Perfect for Business, Sales and Marketing Presentations! Map to Fit Your Presentation Needs! Each state with counties is grouped so that you can easily select individual states. Segment the country exactly like you need to! Easily change colors for individual states AND/OR individual counties. Easily color code states and / or counties to create distribution, retail locations and sales territories. Edit individual county objects, colors and outlines. Easily edit map objects using tools already included in PowerPoint. Add your own text boxes. Customize this Map in PowerPoint by adding your own graphics, symbols, animations and elements! Save maps for PowerPoint presentations, website graphics, other office applications, reports, illustrations and other useful graphics. Save as JPG, GIF, PPT, etc. NOTE: This map Does Not include county names. 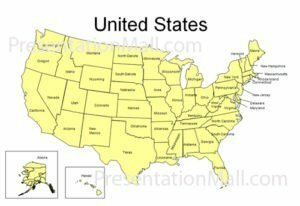 If you require county names, please see our United States County Map in Adobe Illustrator format.